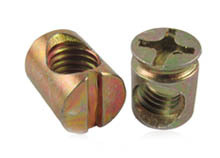 Barrel Nuts , also known as cross dowel nuts. with thread hole cross over. slotted drive or cross recesess drive type. usually it used with Hex Socket Furniture Screws.